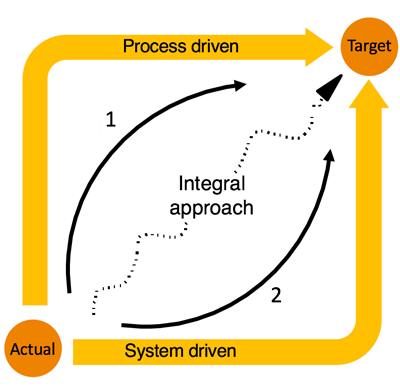 Process or system driven implementation? Implementation planning software: part 3. Timewax will talk about the decisions that you need to make in order to successfully implement your planning software. Part 3: Process or system driven implementation. The final decision you have to make is deciding how the system and the organization (the processes) will be aligned with each other. This often manifest itself as a strong ambition to improve the processes, countered by the major pressure of being expected to deliver something on the short term. There are two extremes: a process driven implementation and a system driven implementation. The basis for any process driven approach is the focus on optimal processes: a so called ‘Green field’ approach, aimed at process improvement. Before implementing the software, it’s important to have a good look at your processes and redesign them where necessary. The benefit of such an approach is that it offers the best fit with the company strategy and the desired results. The disadvantage is that this approach can cost a lot of time. You run the risk that the selected software will not match with the desired process flow. 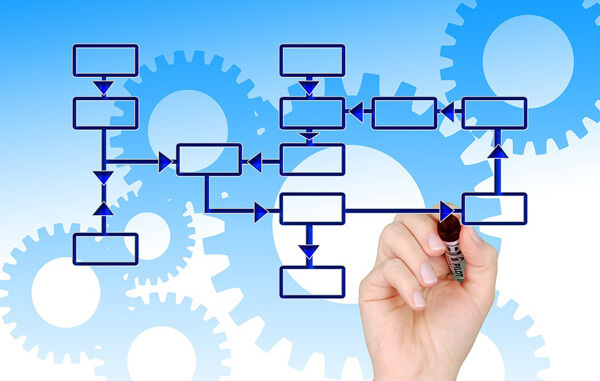 Redesigning processes therefore needs to take place before the software is purchased. A system driven approach takes the functionality of the software as a basis for implementation. Processes are adapted – where necessary – to the software system. The advantage of this approach lies with the fact that you can quickly start making use of the software. The disadvantage is that existing problems in the process are not solved. This approach allows you to pick the “low-hanging fruit”, providing some “quick wins”. Fruit which is harder to pick will stay out of reach. An integral approach, is the best approach. This approach allows you take both process improvement as well as the opportunities offered by the software, into consideration. An integral approach seldom places an equal amount of emphasis on both aspects. It’s still important to decide where the focus will lie. To use this image as an example: Do you focus on moving via the top or the bottom? Do you have the budget and time to implement process improvements? Then that’s where you should put the focus. Are you under a lot of pressure to come up with results? That means the focus needs to be on the system driven aspect. There are many critical success factors that will determine whether project & resource planning software is going to be implemented and used successfully. Some factors are the availability of (qualified) employees , support, tight project management, training, etc. We have not discussed these topics in the previous blogs. We have only taken a look at the three fundamental choices that precede these topics. Opting for either a central or localized approach has a major influence on the amount of support that you will get. The project phasing will determine whether project management will be harder or easier. Opting for either a process or system driven approach will influence the amount of training that employees will need. Consider these fundamental choices carefully, before starting an implementation. These choices will heavily influence the way the implementation will play out.